I haven't posted my frugal achievements for a few weeks; that's not to say I haven't had any, I have. But I've also been super busy, super tired and battling vertigo and this 100 day flu that's going around. So, this is a list of what I've accomplished over the last few weeks, a bit of a mish mash, and in no particular order. Somethings I do without thinking every week (like collecting the shower warm up water) and then there are the other one off things, done to save money, time and energy for our household. This last week I've spent mostly at home, one of my favourite things to do. That means of course that there has been more time to putter around, doing small jobs that get put off when I'm busy. This week all our meals have been cooked at home, from scratch, using ingredients in the pantry, fridge and freezer (they have for the last three weeks). I bought 10kg of potatoes from Pellegrino's for $1.80 (we have enough potatoes to last us about two months now, three if we eat more rice and pasta as the starch in our meals). I made three loaves of wholemeal bread. I made a big pot of pumpkin soup and chopped the other half of the pumpkin into single portions then vacuum sealed in meal sizes. Four meals of pumpkin in the crisper and being vacuum sealed they'll keep for at least four weeks. Took the hem up on a pair of dress pants I was given. Saved the shower water and used it to fill the washing machine. Used craft materials I had to make some cards to send to a friend. Made 10 twist'n'pop cards for an order and sent them off. Gratefully accepted two dozen eggs from Wendy. Took a load of things from the boys to the op shop. Was surprised with a beautiful bouquet of flowers (thank you Karen) and some very yummy salted caramel fudge (which I kept for myself, thank you Joy). Bought 30kg chicken fillets for $3.89/kg. Skinned, bagged in meal portions, vac sealed and put them into the freezer. Bought a whole rump and the butcher sliced it for me. $12/kg - not cheap but we haven't had steak for ages. Used Wayne's after-hours pay for this treat. Six meals vac sealed and in the freezer. Made three pots of pumpkin soup. Two were eaten during the week, one will did lunches over the weekend. Made a double potato bake, had one with tea on Friday night, cut the other one into singles serves and froze them. Made a double batch of vegetable moussaka. We ate one on Friday and Saturday nights, the other one is in the freezer. Bought 1.5kg capsicums for $3. Whipped out the Nicer Dicer knock off and had them all diced in no time. Bagged in 1/2 cup portions and froze them. Worked on our spending plan - May was expensive for us, June looks like it is going to be. Thank goodness we not only have a spending plan but actually use it, all expenses will be covered. Emptied the bottom drawer in the kitchen. It's the "junk" drawer and I can't remember the last time it was opened or we needed anything in it so out it all went. Rearranged the order of the kitchen drawers and put the everyday tea towels in the third drawer. Took Hannah to DFO at Moorabbin where she bought her suitcase for her trip saving $290 - we were both so excited. The case was already reduced as it was the end of that particular case in the colour she chose, then for the long weekend DFO has a massive sale and there was another 25% off! 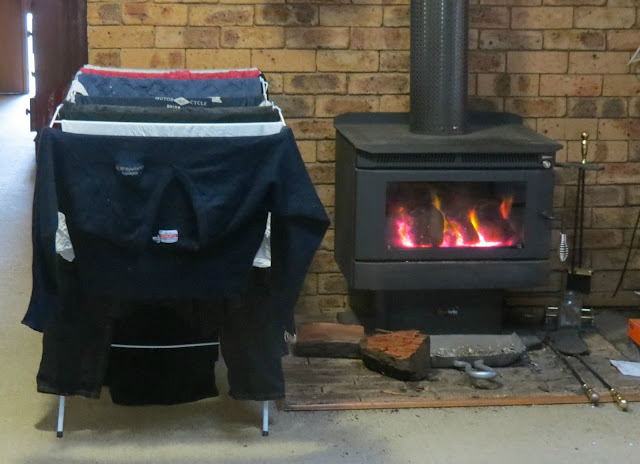 Dried the washing by the fire or outside on the two sunny days we had. Kept the ducted heating off all week and the fire going. We haven't had the ducted heating on at all this winter - a huge saving on our gas bill. Even when we have bought firewood it works out to around $14 a week cheaper than running the ducted heating! We usually go firewood collecting, but this past year because I've been sick we haven't, so we're using a combination of bought and collected firewood. Murphy came to visit. In the course of four days the dryer stopped working and can't be fixed, the TV in our bedroom has gone wonky (yes, that's the technical term for what's happened) and, horror of horrors, the iron stopped working! Good thing is I rarely use the dryer for anything other than extra storage, we can do without TV in the bedroom for a while and seriously, a broken iron? Not my favourite household chore and if the washing is hung carefully and folded properly we can get away without it for a while. Then last Monday I had a fall and landed on my laptop, cracking the screen (that was a very expensive fall!). I'm looking at whether I can claim it on our contents insurance. Found a leak under the laundry trough. Rescued my supply of laundry soap. Found a container to hold all 44 bars of soap. Decanted borax and washing soda into containers. Made a big batch of crumbs for schnitzels and parmas, using broken crackers, Weetbix crumbs and dried breadcrumbs. Made a double batch of KFC mix. Made a double batch of Shake'n'Bake. Made and then stitched name labels into some jumpers and winter blouses for my mother. Added to the stockpile with half-price groceries from Woolworths after checking Aldi prices to make sure they were cheaper at Woolworths. Looked at the Flybuys offers and activated the ones that worked with the shopping list, then shopped at Coles after checking Aldi prices to make sure Coles were cheaper. Added 3000 points to our account and saved $48. Used vouchers to buy petrol for all the cars and made sure my Flybuys card was swiped each time. Took a box of craft materials and two bags of clothes to the op shop. That was my last few weeks. What did you do to save money, time and energy this week? Thank you Karen, the flowers are just gorgeous, they really make me smile. I love colour in the house during winter when outside is so dull and dreary, and they are just perfect.